Well, that was the first… So, what about the second? April 15, 2013 in First year, Olympia SG1, thanks, typecast, typewriter, Typosphere. 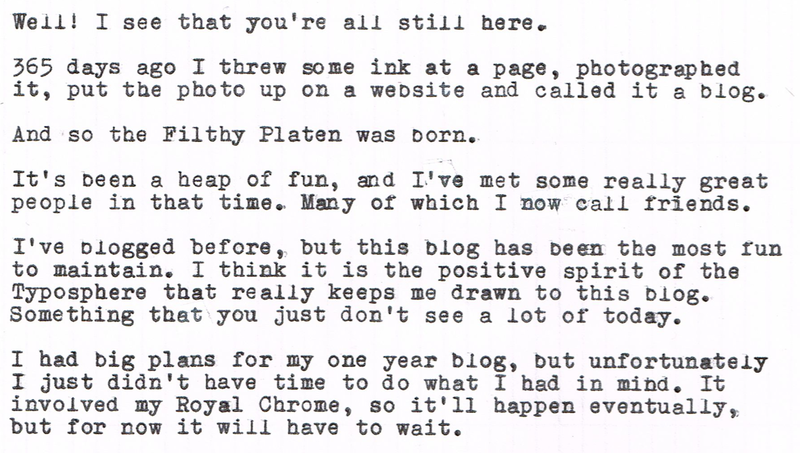 Congratulations on the year, and the very fine blog that has been created along the way. Well I've enjoyed it. Thanks for keeping it up! Thank you! And I've rather enjoyed your blog too! Thanks! It is easy with such great co-bloggers as yourself. Congrats on Year One in The Typosphere, Scott! Thanks for the great posts. Hey, cheers on your first year, keep the posts coming! There is no need to question my sanity. Everyone knows there is none. Congrats on the year, sir. Hey thanks. I just wish I could pull it off with the same sharp debonair style that you've got on your blog! Just try and stop me! Thanks Ton. Ha ha ha ha. I know! Must be a Queensland in Autumn thing. Your machine looks great too. We'll have to get the two of them together and compare them! Every person that has achieved something great, has had their sanity questioned! Well done Scott, I ahve always enjoyed reading your latest offering. Do I detect a line-spacing problem with SG1? and maybe a ribbon lift problem as well. Never fear, Uncle John will fix it for you, LOL. Happy 1st, Scott, keep up the good work! Yay! You survived your first year! \o/ Always feels like a big accomplishment. Even more so if you are still enjoying the blogging and as you wrote also made friends along the way. I certainly hope to read more from you. Maybe a little less if you have something big coming up, but please don't disappear completely! I look forward to another year and many more. Ha ha ha. Oh, it is working far better than it was a couple of weeks ago, but yes.. It could still do with a bit of work. I think I might have to bring him over! Well spotted though, there is indeed a ribbon lift problem, along with a little line spacing. Thanks Rob. My page is no where near as popular as yours, and I have to say… your writing is inspirational to this blog. 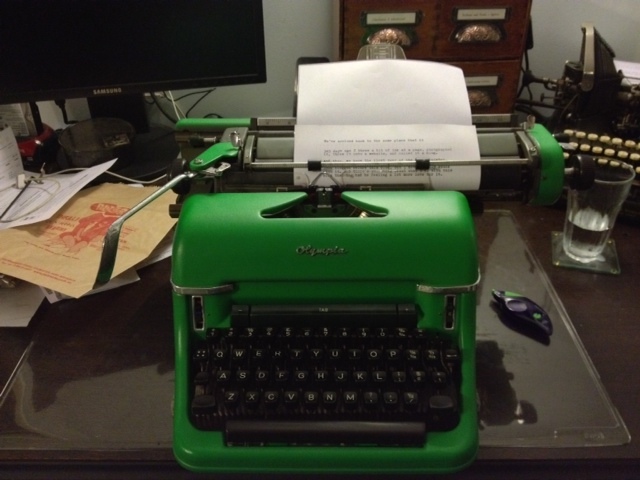 Not to mention, half a dozen of your typewriters powers this blog too! It does indeed feel like an accomplishment. Most blogs tend to die out within a few months. Including most of mine. This one I just enjoy too much to put down. There's some good big things, and some scary big things. (hides under bed) Gah! We'll see what happens. Ha ha ha. Thanks Ted. It can only get better. I'm starting to get a bit of a stride going here. Thanks Bill. And thanks for all the comments too.